"A sony app. that smartly manages audio files performing multiple tasks"
SonicStage is a software with capacity to smartly manage audio files. Besides of clearly managing audio, this software brings an ideal set of tools that will enable you to perform multiple tasks. Once you have organized all your songs, you may create a music library with facilities to easily access all songs by making a single click. 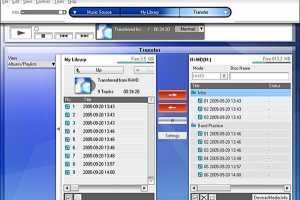 If you have a great collection of songs in CDs you can import them to the program, which allows importing files and folders as well. SonicState brings a built-in player that you can visualize in two modes: Reduced or Normal. In case of the normal mode all the expected information will be displayed. When using the reduced mode you will simply visualize a small player. Author Sony Creative Software Inc.